For decades, I’ve come to the Salmon River to talk about every major transition I’ve faced. My husband Mark’s ashes are here. I ask him questions or sometimes just tell him about my day. Over the past decade, questions have been about selling the home we built together. Selling a home, for some, may be a straightforward walk; for me the path was more like a maze. My questions were in the unanswerable category: Without our home, where would our stability be? How can I still be placed without my place? Even, Can you remind me why I am doing this? Now the decision is over. 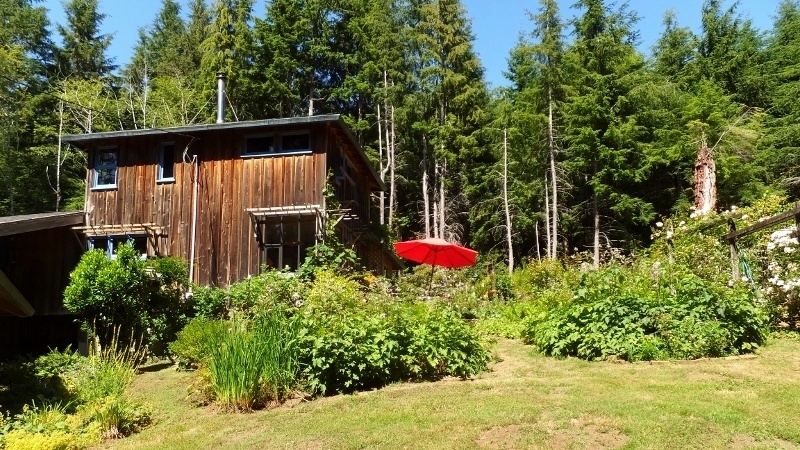 I have sold our home, neighboring the Siuslaw National Forest on the central coast of Oregon. I tell people it is the house I miss, but I wonder if that is true. When I am homesick, often it is not for the house or even the garden but for the creeks, the river, the sea, and my children when they were small, muddy, wet, and streaking down the hill with the dog. I wonder if I am homesick for the irretrievable past. I remind myself that I can return to the woods and sea without owning anything, that my children are grown and healthy. Yet, my mother’s voice returns, “If you have the land, you have everything.” That’s one view. My husband used to say, “We’re OK as long as we have each other.” The riddle has been how to listen to both and come up with a revised answer for the life I have been given. What happens when two pillars of a foundation are simply not there anymore? I am wondering, now, about internalizing love so deeply that, if I own nothing, the love could remain. Mark’s death was like losing home; yet, the tensile strength of that love remains years after the physical body’s decay. We don’t own love, and even when the person or place is gone, we haven’t lost love. It remains in a way that no one can take away. What is ownership? People live rooted in place all over the earth. What they own ranges from spare to abundant. Some people remain for generations, some only until war or tragedy takes both homes and the land on which they’re built. Some are nomadic. Home does not have to be owned. Still. I’ve lived here on the coast forty-four years and have come to this edge of the Pacific since birth. On my desk is a picture of my mother in the 1920s, jumping the waves at this beach holding her mother’s hand. My ancestors emigrated from Norway in the early twentieth century to fish the waters of the Pacific Northwest in a ship called The Republic, docked in Seattle’s harbor. They owned no land, but felt as rooted as they had near the fjords of Norway. Whether land is owned or inhabited without title, what is it that makes us feel rooted enough to be stewards, to take care of the places we love as opposed to defending land in a way that can lead to local and regional turf wars? From the smallest conflict and escalation my friend experienced over boundary lines in a Portland neighborhood to disputes over public lands in Eastern Oregon, ownership can feed the misconception that we not only own the land, but the town and sometimes even the people, when we are just passing through. And, if we are just passing through, what is it about place that binds us to that spot, that soil, that mountain and river, that ocean? I wonder if our most basic needs beyond food and water include feeling placed, feeling joined to one another by the land on which we live. I wonder if what I value about place—the mystery of belonging; a richness of feeling loved and heard; a chance to do the work of living and service; a chance to learn to leave the earth with some measure of grace; an opportunity to feel loved no matter where I live—I wonder how these things can be joined to places I don’t own, yet feel a sense that they are “mine” for the time I walk there. I feel this about my home state, Oregon. I feel it in the North Cascades, in parts of Montana, in the Puget Sound. I feel it when I take my bike to Sauvie Island or hike Rowena Dell. I felt it daily when I lived on the coast. There, the mystery of belonging came by predictable markers: the elk bugling, mating and calving; the soft feel underfoot of duff and detritus in the woods; the way the creek raises and lowers with the tides. The measure of time was in the blooming salal and Oregon grape, in the migrations of songbirds, in the ebb and flow of the miles of walkable sandy beaches. Living remotely has a deep draw, a Whitmanesque picture of tranquility and peace. These might be reasons why people tend to romanticize living at the coast. I understand that. Many of those images are fact. The air is crisp and clear. The pace of life is slower. The stars are thick on a summer evening. The sea is simply spectacular. If you need to make a living, however, it is difficult to find a position that can sustain a family. Unless you are employed by the school district or county, work for the casino, or are self-employed in the trades, your wages won’t be competitive. You will not have benefits such as health coverage, retirement, or even basic sick leave. This means high gas consumption to commute to jobs that match your skills, a fact that induces both draining of funds and a shadowy guilt when you read about wars over oil. Round trip mileage for my work was to Newport, 90 miles; Tillamook, 70; Salem, 100; or Portland, a whopping 180. I chose to piece together employment through teaching contracts and grants that allowed me scheduling flexibility and more time with my young family. I picked up some local work by cleaning tourist rentals and running a small garden business. At the junction of Slab Creek Road and Highway 101, I’ve headed north, south, or east depending on where I was working. I skirted the edges of Lincoln City, Depoe Bay, and Newport to the south. To the north, I passed through the boundaries of Cloverdale, Hebo, and Tillamook. East, I bypassed Dundee and McMinnville on my way to Tualatin and the big city of Portland, where I was born. Outside my window, gray fog sketches a black line around the alders that could be mistaken for birches from this distance. But birches bend gracefully in heavy gusts. An alder is more prone to snapping or simply uprooting. Unlike the birches where individual boughs toss up and down in high wind while the trunk remains steady, alder limbs litter the road after the heft of a storm. Winter, like some burly logger, fells trees and dams up spring waters to create habitat for spawning salmon. In a tangle of labyrinthine roots that wrench from the soil, snakes and birds, squirrels and insects travel the memory palace of the rotting tree. I want to be like the birch and practice a graceful bending while maintaining stability for myself and others. I am not. I am more like the alder, awkwardly, stiffly resisting the winds of change. At our coastal home, spruce and hemlock, alder and maple were neighbors. Some trees probably contain the ghost residue of my hand from the times I pressed my palms into the trunk, or put my ear to the bark to see if I could hear the pull of resin. Trees have given me a perspective on time and tenacity. They’ve stabilized my life that, at turns, has been chaotic and unsteady. They’ve sheltered my family and provided excellent hiding places as we lumbered through the woods like one large animal whose tail was always me. Underground, their rooted proximity suggested how a family connects, even across barriers, with roots not touching but close enough for support and nourishment. Like me, trees live and are defined by their roots. Unlike me, they don’t question or worry—that is the wisdom I project on them at least—a symbol for acceptance of what is. I’m coming to believe in my own memory palace that lives in my roots and the roots of my children, a stability that remains even as visible markers disappear. Look at the big picture, I tell myself. You got to live here for over half of your life; your children were able to grow up here; you got to love the land and leave good soil. Maybe, a friend tells me, we all feel vulnerable when we face our mortality. I think of this frequently when I look at a whole life. But, she went on to say, there is something fundamentally different between having resources like a house and the financial security it affords and not having that. She’s right. Ironically, our home had become more economic drain than security. As my ability to keep it up slowed, the need for repairs grew. I knew the time was coming when those repairs or even those of my own aging body would not allow me to keep up financially. I tell myself I am resilient, that no one is dying here. I am not fleeing civil war like some of the people seeking asylum in this country, leaving everything, including language, culture, and family. My children have given me the current version of “As long as we have each other, we’ll be OK.” But, some days, my chest tightens and grief takes over every breath. I plan ways to return to the public campgrounds I can inhabit during summer months when the city is hot and dry, or accept the invitations from friends to stay in their meadows and extra rooms. I dream of the places I’ve claimed, the public forests and rivers, the beach that, thanks to past governors, I can get to without having to trespass or crawl over chain-link fences. I will also go back just as my loved ones come back to me in dreams and memories. In unclaiming the land, the security of home began to emerge as something that wouldn’t leave when we did. It would have a portability I am coming to understand. All living things experience mortality or at least redistribution through decay and rebirth. Lives are shaped by unpredictable change and the certain change of death. I would love to say I am at peace within the shaping of my life; but I know that all that is here today, both people and things, could change or disappear within the space of one sentence, one experience, one tragedy. If I can’t claim peace or calm consistently, I can say that what loss has taught me is to recognize what lasts, what you can and can’t do, and that the fruits of love and stewardship remain. Some days that is cold comfort; other days it is all that matters, and I say to myself, Get busy, you are alive. I have lived a different life than I anticipated; a different life has chosen me. If the alder was human, I think it would bend as I do, some days stiffly, yet with a living thing’s determination. Making a new place home is a slow weaving. In Portland, I am firmly connected, gratefully connected to friends, family, and work. Yet the first time I felt that sense of “home place” was when I hung bird feeders outside my apartment and my son dragged top soil in to a new small garden. I am learning to time the first flight of crows against sunrise and the palest blue or grey sky. I am learning when the juncos arrive, about 10:00 a.m. to feed off the seeds the chickadees have dropped from the feeder. I am learning that, if I walk the Marine Drive trail along the Columbia River at around 4:00 p.m., I see the same “bird guy,” who will, if I ask, share with me what he is sees through his binoculars. If my walk is just after sunrise in warmer weather, I will exchange nods with Oregon Guardswomen and men out on morning fitness runs. In the year and a half I’ve been in the city, I’ve visited the waters that have fed my ancestors. I’ve sat by urban creeks, Johnson, Tryon, Balch, and even Tanner to the north of busy downtown. I’m slowly living into the life I have now without expectations of what it should be or even could be. I’m discovering that I have always been a bit nomadic, curious about the same things—the flight patterns of birds, the waterways, a garden’s growth, the angle of light, the weather, the people. So many leavings in the fall when I drove away from my home of nearly forty years—the leaf from the alder, the tide from the edge of sand, the rain from the sky. My memory palace knows all the secret places and gentle waters of home; knows the bends of the creek where no one lives except for what is underground and underfoot. Near these markers, these storied places, our home gave us a place to live, a place to create a business, a place to rent out if I needed to work away, a place to which my children could return as adults after leaving. It gave us joy, sorrow, despair, and hope. It gave us a place to heal our spirits after great loss, and that reconstruction was different for each of us. Becoming whole took time and the freedom of the forest; it took safety and big, long autumn bonfires. It took the strength of each one of us to build those roots sturdy enough to sustain us for a lifetime. Melissa Madenski’s poems, short stories, and essays have appeared in magazines, newspapers, and anthologies. She has taught throughout the Northwest in public and private schools, correctional facilities, and as Multnomah County Library’s adult literacy coordinator. She and her family lived on the Oregon coast at the edge of the Siuslaw National Forest for nearly four decades.